Cost: $2000 per person includes a $500 tax deductible donation. A trip with a difference! 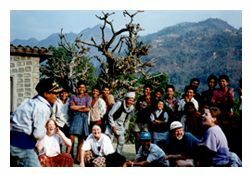 Travel to remote parts of Nepal as project donors and get a chance to become part of the village life. This trip is truly different from most organized tours to Nepal. Upon our arrival, Michael Rojik, the co-ordinator of the Nepal School Projects will meet us at the our hotel. The extra donated clothing we have brought will be taken to a warehouse to be organized for distribution to the villages we will be visiting. Our porter assisted 10 day trek to the Mahabharat region will take us through lush terraced valleys and deep into a little known part of Nepal. This is not a trekking area and only project donors visit this magical place once a year. Every night we stay near or in a village and take part in singing, dancing and games. Oct 31 - Arrive in Kathmandu and find your way to the Shanker Hotel. (www.shanker.com.np) We will all meet in the main lobby at 4 pm. Nov 2 - Early departure at 5 am. We will be bused to starting point, east of Kathmandu, where we'll meet our porters and guides. Trek to first campsite. Nov 3-10 This 10 day trek gives us a tour of the project area and Michael will show us schools, medical posts and water systems that have been built from donations. Each morning our guides will wake us by offering us a cup of tea in our tents. We then pack up our belongings and have breakfast. Our porters will load everything onto their backs and we follow them and our guides to the next campsite, each day getting farther and farther away from the road. With lots of rests and a two-hour lunch break these days are relaxing, even though the terrain is steep. Our porters carry everything except what we have in our daypacks. (water, camera, phrase books, sunscreen, snacks) Each night we camp near or in a village and get to know the locals. Games and songs are encouraged by us since the Nepalese are very shy but very willing to participate in fun events during the evenings. Eventually we arrive at the village that will use our donation and given the details of what the villagers have planned. On day 14 we arrive back in Dapcha where our bus will be waiting to take us back to the Shanker Hotel in Kathmandu. Nov 11 - Back to Kathmandu and Shanker Hotel. *Note - the extra days at the end are so that we can remain flexible with the number of trek days or any delays that may occur.